Early mornings kind of go with the territory around here. With work, kids and the never-ending list of chores every homeowner has the wee hours are often the only time one has to exhale. But I’m a crepuscular creature and that suits me just find. Last Sunday morning (Nov. 11) I took my coffee out on the deck just as the southeastern sky was beginning to turn rosy around the peaks of the mountains. Sitting in the not dark but not light just out of the sun’s grasp was a crescent sliver of light clinging to the bottom of a dark round shadow moon. And beside this waning crescent moon was shimmering blue Venus. The two danced together teasingly just ahead of Sol as he lumbered over the mountains to start the day. This celestial dance is a reminder that as we turn away from Sol to face winter, the heavens are in transition. 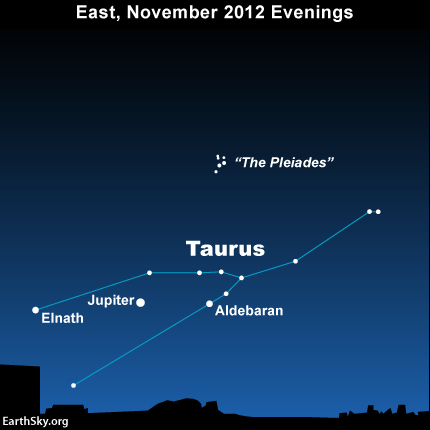 The bull, Taurus, rules the November nights, rising around 8 p.m. and standing overhead by midnight. There are four clues to help even novice star-watchers like me see Taurus. The bull’s face is formed by a triangle of stars. Now, Taurus is romping upside down in our night so the triangle is tilted upwards. The orange star Aldebaran shines brightly along the bottom (to us) of this triangle. And to our left of Aldebaran is the bright planet Jupiter. And almost directly above Aldebaran are the “Seven Sisters” or “Pleiades” that distinctive little dipper-shaped cluster of stars. Orion, the hunter, is also climbing into the evening sky and will become more prominent as November rolls on. And November wouldn’t be November without the Leonids, caused as we fly through the dust of comet Temple-Tuttle. The Leonids can sometimes offer spectacular meteor showers but this year’s show will be somewhat subdued with perhaps 10-12 “shooting stars” per hour from midnight till dawn on Nov. 16 and 17. That’s still a meteor every 6 – 7 minutes and the kicker is – the new moon will not hide the show. Other cool things to look for in the November night according to the Astronomy Club of Asheville’s website include Mars near that waxing new moon on Nov. 15 through 17. A cool planetary conjunction will occur in the dawn sky on Nov. 26 and 27, as Saturn will appear within one degree of the bright morning star – Venus. Mercury will join Saturn and Venus in the dawn sky on Nov. 30. And from conjunction to juxtaposition – on Nov. 28 as the almost full moon rises, Jupiter will be less than one degree away. The Astronomy Club of Asheville has some great PDF downloads regarding the happenings in the November night sky. You can find them at www.astroasheville.org. You can also find info there about the club’s next star gaze, happening on Nov. 16. This event will be held at a private site – the Grassland Mountain Observatory in Madison County, but directions will be available at the website.